Paris is Paris... But France is a whole lot more than Paris. It's one of the world's top tourist destinations, and probably the country that, as a tourist destination, has most to offer in terms of variety, history, landscapes, museums and more. 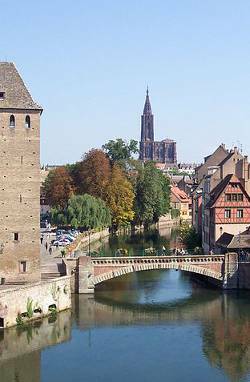 There is so much to see and do in France, that choosing ten "must see" sights is really an impossible task. The list below covers ten sites of exceptional interest in France, outside Paris and the Paris region. Most of them are recognised as UNESCO world heritage sites; most attract large numbers of visitors. All are very much worth the visit. Chamonix & Mont Blanc (Rhône Alpes) While the whole of the French Alps is an area of outstanding natural beauty, the Chamonix valley, lying beneath the eternally snow-capped peaks of Mont Blanc, Europe's highest peak. From Chamonix a rack and pinion railway takes visitors up to an altitude of over 1900 metres, for a view over the "Mer de glace", the last surviving glacier in the French Alps. Detail from the medieval sculpture on the west front of Bourges Cathedral - more interesting and less restored than the sculptures on Notre Dame in Paris. And far less visitors. If you plan to visit any of these sites during the busy summer period, you are strongly advised to book accommodation well in advance. Last-minute booking may be possible, but is not advised, as accommodation may well be fully booked , and you may need to book a room quite some distance away from the site. 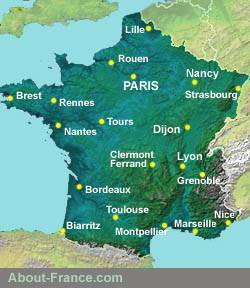 Click here to search for hotels throughout France, with best rates and online booking. Click here for a detailed map of France, which you can scroll and zoom on any area. Copyright texts and photos © About-France.com 2007 - 2019 except where otherwise stated.